As per the statement made by the Telecom Minister Shri. Ravi Shankar Prasad on Rajya Sabha, Government of India is promised to ensure non-discriminatory access to Internet to all citizens. The Minister made this statement as members from different political parties voiced their concern on this matter. "Government stands for ensuring non-discriminatory access to Internet for all citizens of the country. It is committed to the fundamental principles and concept of net neutrality, keeping the Internet accessible and available to all without discrimination," IT and Telecom Minister Ravi Shankar Prasad said while replying to a Calling Attention Motion. "Connectivity to Internet must go in an unhindered manner. I assure the House that the key principles of net neutrality will be followed while following concerns with a national outlook," the minister added. Members from all parties voiced their concerns on the matter of Net Neutrality. The members compared net neutrality to supply of electricity and water in a house on which separate tariff cannot be put based on the use of electronic gadgets or the location of water taps. Telecom minister reiterated the government's commitment to the core principles of net neutrality. 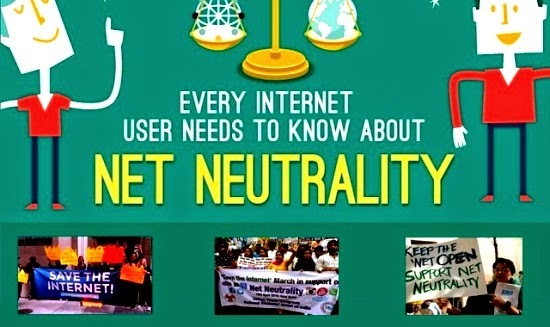 "It is imperative that we not only preserve but also foster non-discriminatory Internet ecoystem, wherein telecom service providers, content and application providers, industries, entrepreneurs and above all the citizens of the country have a stake," Prasad said defining net neutrality in the works of Professor Tim Wu, who coined this word. He said the government agrees with the view point that blocking and deliberate slowing down / speeding up of lawful content on Internet should not be allowed and customers should have unrestricted access to all lawful content on Internet. "There would be instances, such as traffic management, national security, integrity of network, investment in infrastructure etc, where the implications of net neutrlity would need detailed expert examination. This is what governments and regulators all over the world are grappling with," he said, adding that "very few countries have specific legislation for enforcement of net neutrality provisions." Dear readers, please share your views and opinions about this latest statement made by out Telecom Minister via comments with us.